Home // VERTE CHAIR: ADJUSTABLE BACK. HEADREST #22011. COMFORT ALL THE WAY TO THE BONE! 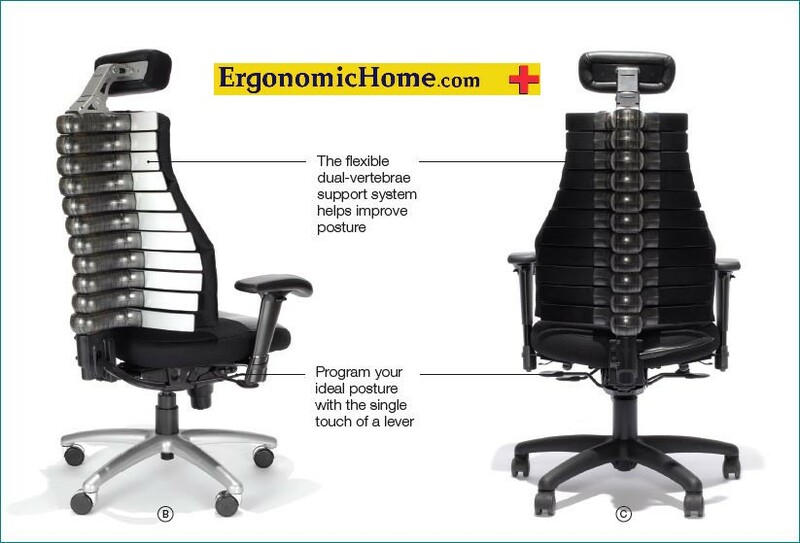 ERGONOMIC HOME.COM HAS YOUR BACK! VERTE CHAIR: ADJUSTABLE BACK. HEADREST #22011. COMFORT ALL THE WAY TO THE BONE! 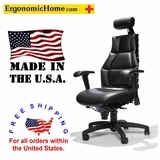 ERGONOMIC HOME.COM HAS YOUR BACK! 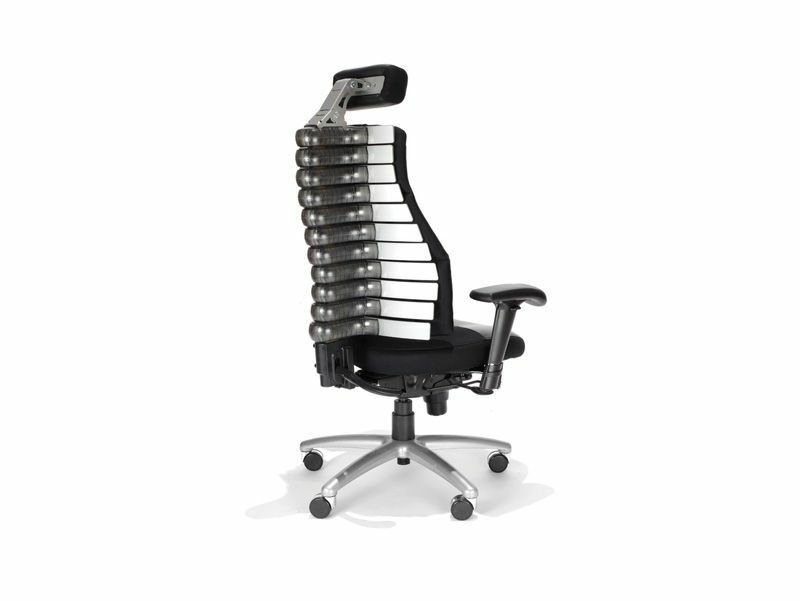 VERTE LUMBAR SUPPORT CHAIR: ADJUSTABLE BACK. HEADREST #22011. It has custom chair features of 11-torsion spring loaded vertebrae that take an exact impression of your spine as you move for comfort that goes all the way to the bone. The back on the lumbar chair support is also lockable. 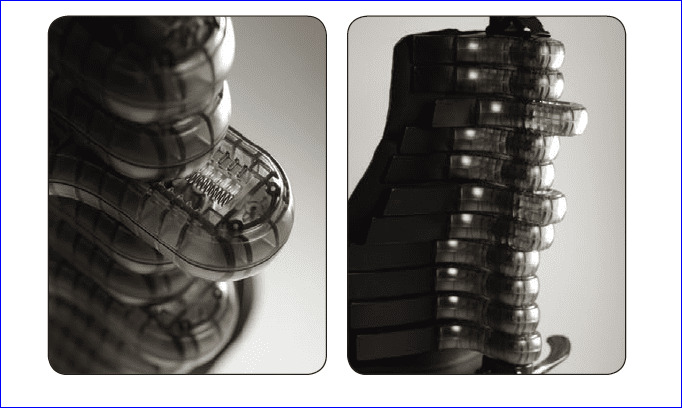 Or you can adjust each of the 11 vertebrae individually and lock. We have been selling the Verte Chair since it was introduced into production in September, 2004, longer than any other Internet retailer. I personally have been sitting in a Verte Chair since then. So if you want to talk with someone that actually knows something about the Verte Chair you can phone Ergonomic Home free at 1-877-550-2678 or click to email Tom. 40% off MSRP. Free shipping too! 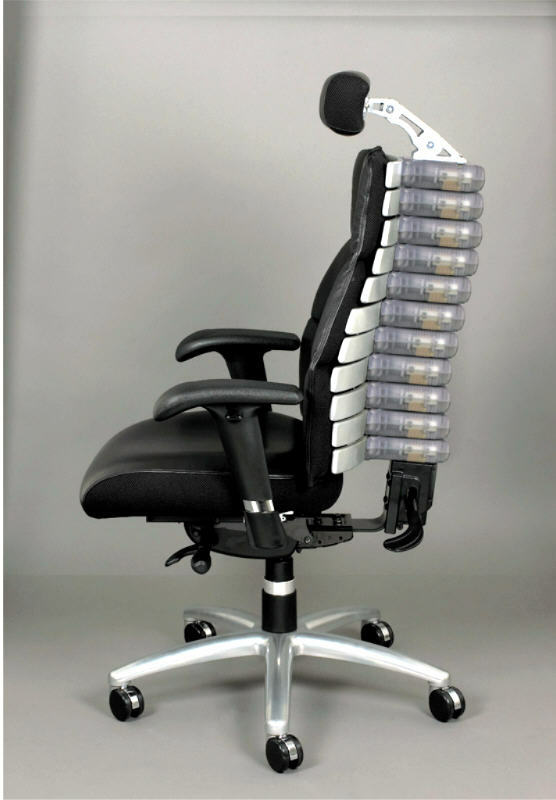 Ergonomic Home has got your back! Black leather is standard on the Verte lumbar support chair. Trim on the arms, back (silver painted aluminum), and base (nylon) is silver as illustrated. Optional 1/2" thick foam - above right - for a total of 4 1/4" foam thickness for maximum comfort. 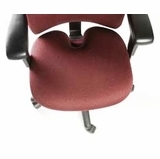 For your additional comfort you can add custom office chair options such as: (1.) The optional coccyx seat cushion - tailbone chair cut out that relieves pressure on your tailbone. Picture and link below. Select above right. (2.) The memory foam chair seat option relieves pressure on your tailbone too. Select above right. Added benefit of the Verte Executive leather chair is the quick release back upholstery. Snap off to experience the cool metal vertebrae and keep cool. Keeps you cool like a mesh office chair. 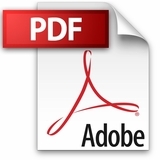 You also will experience a more pronounced action of the 11 independently adjustable vertebrae. You can quickly re-attach the back upholstery with four snaps. Optional foot-ring. Must use 140mm cylinder. Select above right. Optional premium Italian leather aniline dyed cowhide with additional leather colors add $359. Review chart below then enter in "Comments" during checkout. Dimensions: back width=20.5", seat width=21.5", seat depth=20.5", back height=23.5" not including the headrest that adjusts 10" in height. Warranty: Lifetime warranty on cylinder, 7 years on all other parts. Optional Caprone Leather. Review Here, Enter In Comments During Checkout.